A multitude of different datums, different ellipsoids and different projections, confusion within countries as to appropriate datums, projections and transformations to use, confusion and delays in cross-border projects including transport corridors, mapping projects, conservation and environment, exploitation of mineral resources and confusion and conflict regarding international borders. Consequently, the African Geodetic Reference Frame (AFREF) was conceived as a unified geodetic reference frame for Africa to be the fundamental basis for the national and regional three-dimensional reference networks fully consistent and homogeneous with the International Terrestrial Reference Frame (ITRF). AFREF was established as a continental reference system as a basis for national reference networks. It was also established as a permanent GNSS (Global Navigation Satellite Systems) base stations such that users will be within 500km of a base station and that data is freely available to all users. It is also meant to realize a unified vertical datum and to support efforts to establish a precise African geoid. 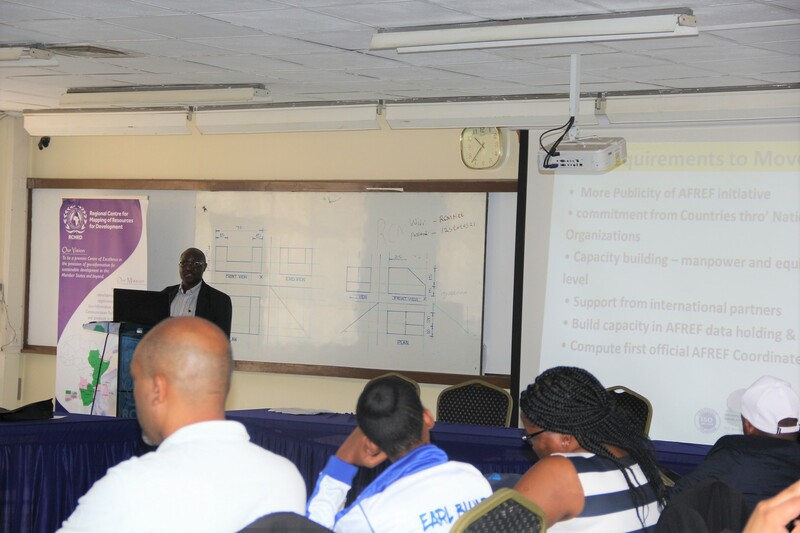 The 2019 edition of AFREF and GNSS Data Processing Training was held at RCMRD premises between March 4 and 8, 2019 with over 60 participants from across Africa. RCMRD is mandated to coordinate the implementation of the AFREF project. The training was supported by various firms such as Trimble, Leica, TOPcon, ComNav Technology, Measurements systems, SinoGNSS, OAKAR services and SEGAL. 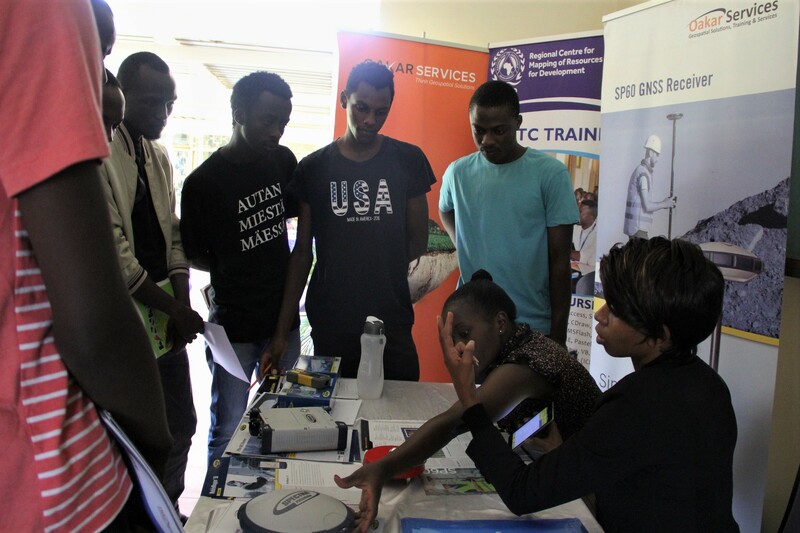 The purpose of the course was to provide technical skills in the establishment of AFREF and National Real Time GNSS Networks, installation of CORS, handling, dissemination and processing of GNSS data. AFREF has been held in September in previous years but was held in March which was agreed upon by partners from this year onward. The one week workshop instilled skills on data collection using different data collecting systems, and post processing of the data on the trainees who were mostly land surveyors, engineers, lecturers, and data collectors. In his opening remarks, Director General RCMRD Director General Dr. Emmanuel Nkurunziza said, "I encourage individuals from different countries to advice policy makers to use modern technology as far as survey measurements is concerned." The main areas covered were on Global Navigation Satellite Systems Technologies on data collection and data processing, and the aim, effects, and the structure of AFREF in Africa. The participants heard that, AFREF aims at harmonizing geodetic systems from neighbouring countries into one reference system, i.e. from local reference system to global reference system. Moreover, it also unifies vertical controls in the region. To achieve this, GNSS base stations require to be established such that users are within 500km from a particular base station. In Africa, there are countries that have established GNSS base stations such as Kenya Rwanda, South Africa, Botswana, and Ethiopia. With these, a data collector Kenya can be connected to a Continuously Operating Reference System (CORs) in any African state. 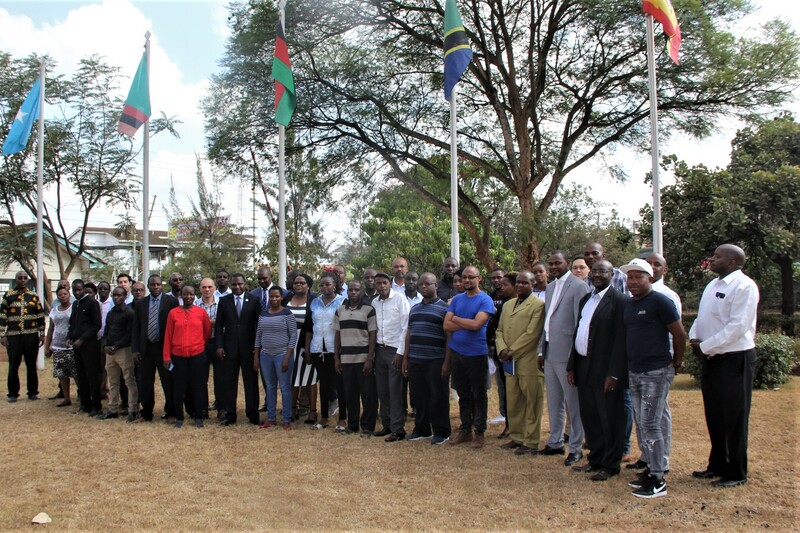 In the workshop, other member States of RCMRD were urged to advice their policy makers on the need to establish GNSS base stations in partnership and assistance from RCMRD. Giving the status of implementation, Mr. Muya Kamamia the Principal Geomatic Officer at RCMRD said that presently, 22 Countries had established GNSS permanent stations, more than 50 permanent stations are sending data to AFREF data holding centre, some countries have CORS networks including South Africa, Botswana, Rwanda and Namibia while most member States have carried out feasibility studies to establish AFREF with the support of RCMRD. He also said some countries were currently implementing AFREF via World Bank support and they include Rwanda, Uganda, and Zambia. He also said other countries had resources from their national funds including Botswana and Kenya. Muya said when fully implemented, AFREF would consist of a network of CORS such that a user anywhere in Africa would have free access to including the generated data. On the way forward, the workshop concluded that there was need for more publicity for the AFREF initiative, while more commitment was required from Countries through their National Mapping Organizations as well as the need for capacity building (manpower and equipment at national level) and support from international partners. It was also agreed that there was need to build capacity in AFREF data holding & analysis centres as well as computing first official AFREF Coordinates. It was also agreed that AFREF and CORS networks shall be used in all applications requiring positioning and mapping including; Topographical mapping, cadastral mapping, precision farming, civil aviation, asset tracking & monitoring, monitoring earth crustal movement, weather forecasting and construction via automation.